AMALIA 02326354 at the Dutch river Maas. I wonder if this is a cable-ferry.... pulled across by a cable? Our Captain's blog way back on the 3rd of November 2015 had an entry with the title "Shipping at Trondheimsfjord" featuring some images from September of that year when, quote, “the light was more prominent". Some were taken "from a great distance" with high-end telephoto Canon lenses (the ones that he's thinking of selling? ), and moreover on an evening/ night shift (think dark, moving ferry, and cranking up the ISO). Any hint of graininess that ordinary mortals like me (not withstanding my undeserved Official Photographer CVF rank) would hardly notice, let alone criticise, resulted in profuse apologies. But none of that was the reason I remember that old blog post ...the bLOG you think nobody reads dearest pakarang! For some reason your photo of a brand new ferry, which you only just caught when she'd docked the morning you were heading for a day-shift, stuck in my memory. Her name was Ytterøy and she was on the way to take up service to the island of the same name from Levanger for the company Fosen Namsos Sjø. Neither of those places were known to me in 2015. I could never have imagined that I would, in August 2018, have been taking the eponymous ferry to that island in pursuit of the unique veteran sail-steam vessel SDS Hansteen on a magical voyage captained by none other than our Captain of CVF! No wonder folk think I have a kind of 6th sense! So here are some photos I took of Ytterøy the ferry, IMO 9724130. Views of the ferry taken from a restaurant terrace near the old steamship pier in Levanger. Views around the ferry terminal at Levanger. The island is popular with cyclists. I missed seeing cars driving aboard as I had gone inside to pay my fare at that point. Outside photos from the crossing to the island, which takes just over 20 minutes. Finally a view of the ferry arriving at Hokstad on my return journey to Levanger. Thanks for sharing those on-board photos especially. After so many years, I have still never been on board nor have I ever traveled with this ferry. BERGSCHE MAAS 10 02332659 at the Dutch river Bergsche Maas. That has got to be a cable-ferry? I can see the cable hanging on the side. Following on from my photos of Ytterøy, here is another ferry called Levanger, and moored in Levanger next to where Ytterøy docks. 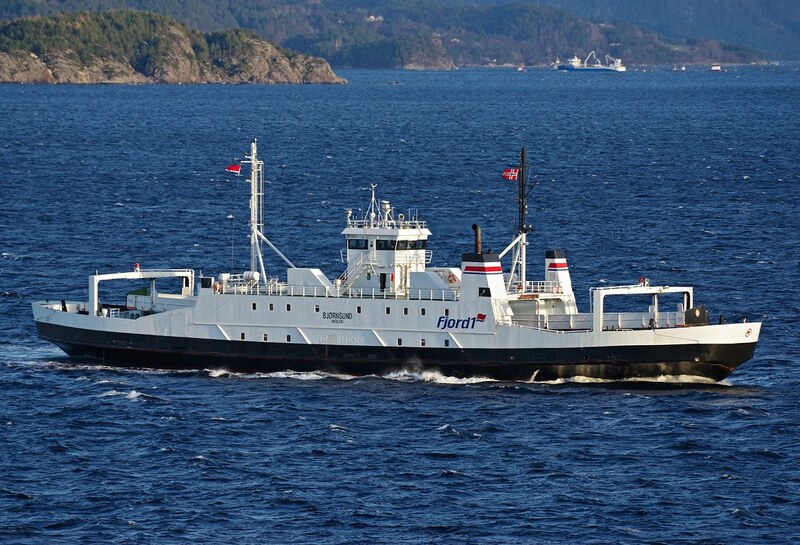 It appears to be the reserve ferry for the Levanger - Hokstad route. I think it was previously named Florøy. You are indeed correct as to previous name and current state. She is kept as a reserve should there ever be a need for her to step in. Nice pictures of an older classic when it comes to ferries. As Donald T would have said so cleverly: "When it comes to ferries, this is the most ferry it can be". A total of 70 such ferries are expected to be in service in Norway by 2021. That's a very long way from what will be their home.... ! Could be fascinating to be a part of the site-team in Singapore, though I'm not working at Norled. B/F BJØRNSUND (ex. TRONDHEIM in the Flakk-Rørvik route) seen her on her way from Tømmervåg (Tustna) to Seivika (Kristiansund).